Shas has been bugging me to make this guide so here it is. He even made a banner! Although my main toon is a short Kellari dude. There may be better ways to play this but this is my interpretation. Defilerocle is a DPS support variant that is useful at boosting your raid healers output, offering all of the necessary Oracle/Bard buffs as well as the extra 5% magic damage taken debuff to bosses that are applied by Defilers/Inquistiors. This is not a main support spec, but should be used alongside an Archon. In ideal conditions you should be able to hit over 800k dps raid buffed in T2 gear. This pretty much plays like straight Defiler. 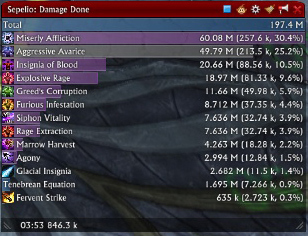 Oddly enough this spec actually does superior DPS compared to 61 defiler. Oracle lowers your global cooldowns to 1 second and Battle Fury is actually a far superior 41 Point talent to Unstable Transformation since it lasts twice as long. In General your curses won't be used, Archon ones Last 4 minutes. But yours can be useful for large groups since your curses debuff everything around your target. Work that out with your raid lead and other supports. Keep up your Defiler DoT's and try to cast Explosive Rage and Aggressive Avarice as often as possible. Your DoT's break into 2 categories and will build stacks of either Greed Or Rage at random times on your buff bar. Your Greed DoT's are Miserly Affliction and Greed's Corruption. Your Rage DoT's are Rage Extraction, Furious Infestation, and Siphon Vitality. Miserly Affliction is by far and away your biggest source of DPS. It ticks an extra time for each Rage DoT on your target. So it is ultra important to keep those Rage DoT's and Miserly on your target. When you're not refreshing DoT's you'll be using your spam button and then using Aggressive Avarice or Explosive Rage when you have 5 stacks of Greed Or Rage. The spam button has Glacial Insignia and Marrow Harvest in it to maintain oracle buffs and Tenebrious Distortion. The final ability is miserly affliction. We do that to get greed stacks back faster for more Aggressive Avarice. It's a DPS gain to take Marrow Harvest out of the macro and cast it manually every 30 seconds. But this way is easier. It's also good to recast Miserly Affliction as the first ability after Battle Fury+Furious Might. The boosted DPS will improve your overall numbers by quite a bit. These are my multi use kalerts for defiler sub-specs. Some stuff you won't need, but abilities you don't have won't show. If you run a low resolution you may need to reposition them as well since I keep my alerts on the lower right portion of my screen. 72 Raid Dummy parse with no consumables or weaponstones. Last edited by Skiye; 03-11-2019 at 06:24 PM. Can we call it FrootyLööps? Last edited by Shas; 03-03-2019 at 06:13 AM. Main point of Greeds Corruption is to gain Greed stacks. but the offensive FrootyLööps has 'Rampant Greed' which makes Avarice procc almost every 1-2 Misery Affliction anyway. Why Greed's corruption so late? You want range stacks asap to get as many Explosive Rage into Flaring Power as possible while Misery Affliction proccs greed stacks already. Greed's corruption is your strongest default dot, benefiting from emblem of ice. Apply it when your first Rage Extraction and Furious Infestation run out (after 24 secs) and refresh them together from then on. Last edited by Shas; 03-03-2019 at 08:20 AM. TBH if you're Archon is putting up Lava+flaring from the get go it would probably be wiser to tell them to delay it 3 seconds. The chon's first couple GCD's should be to get up phys/non-phys and then Illuminate debuffs up. Plus most of the popular dps specs have bit of a ramp up time. Ele/Pyro, Riftblade, MM being the ones that come immediately to mind. Most would benefit from a 3 second lead in before the big raid damage cd's. The Fervent + Spam Button x2 (to apply buffs and TD) should perfectly match those lead in times. Just my opinion though, take it or leave it. Last edited by Skiye; 03-03-2019 at 06:56 AM. 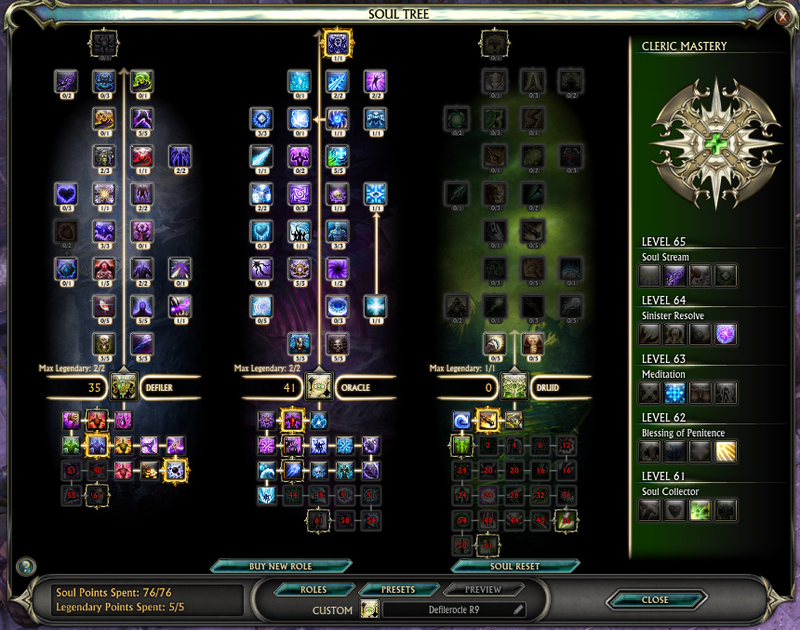 Added a parses to give an idea of what the damage breakdown looks like. Last edited by Skiye; 03-03-2019 at 07:45 AM. Illuminate is hardly worth the global cooldown and should be used with the lowest priority. For fights in the range 05:10 - 06:00 minutes it is best to start directly with Lava Field and Flaring Power. This allows you to use the second CD block longer. When you don't plan to use Pillaging, sure. May want to check the dps specs in your group and then decide your priority. Only the onbuttons are dpsing right away but who tf cares about minmaxing onebuttons? Going Flarring Lava first means you buff ****ty build up abilities like Dusk Strike, Fervent Strike, Ravaging Strike, Ignite or Precision Bolt for 3-4 seconds and make the cd's end 3-4 seconds earlyer which may makes it miss a full RFS, Glacial Strike/ AI, Rift Burst, 6 hits of Crystalline, Fury Blast etc. It really depens who are your dps and who play them. Not the best ST point layout but at least there is a guide for it now. If you are actively cleansing in full T2 + raid buffs you should be well above 800K. Depending on all raid buffs.. crit buff/primal buff and actively using Greed's Call wisely it is not impossible to hit even close to 1 million. This is the only spec I actually considered for a long time that set cleric apart from the rest. Unfortunately, a lot of guild leaders are still too derp to allow their clerics to play it. Even asking for them to play inquisitor although it brings the same 5% magical debuff + inflates the DPS of other DPS much better than the bard hybrids can do.. I think one of the problems is that it is still slightly too low on the dps to make it definite raid spot. Maybe if Gamigo buffed it by 10-15% or to the level achievable by a chon dps it will force raiders to acknowledge how great it really is for them and the cleric class as a whole. Last edited by Flashmemory; 03-04-2019 at 01:18 AM. With precasting Void Bolt instead instead of Volcanic Bomb and start with Granite Salvo (2500 AP/SP Buff), you unnecessarily delay the other important Archon raid buffs in favor of your own DPS. The 2500 AP/SP Buff should come from the Bard/Oracel to get all the important raid Buffs as fast as possible. Starting from having a proper countdown, often you end up with a ninjapull and 1 sec reaction time which means even with a Volcanic and Crumbling oyu end up on a 4sec cd timing. Idealy 2500 gets applied by bard/ora and you use one pillaging stone after iluminate to get the earth Primary Bolt running for your cd's. Sometimes you don't run a Bard etc then ofc Granite is a priority cast and takes care of the initial earth Primary. The Void bolt thing simply ended up being a gain for me while not lowering the support capeabilities. Gladly taking a programm to simulate rotations with btw (min max potential, refreshing dots early etc) still there is -as it ever was- a difference between theoretical math and a live encounter. Why do we talk about Archont here btw? Not the best ST point layout but at least there is a guide for it now. If you are actively cleansing in full T2 + raid buffs you should be well above 800K. Yeah you could take a point from glacial insignia and assign it elsewhere, and manually cast wasting to keep your buffs up. It plays a lot easier with 1 less thing to manage with GI though. Any other suggestions you'd make? /me hides from his own creation. Last edited by Shas; 03-05-2019 at 05:51 PM.